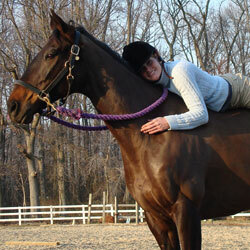 Orion is a 10 year old Thoroughbred gelding who I bought as a not-quite-3-year-old off of the racetrack. He wasn’t cut out for a career as a racehorse, but he is thriving in his current career as an eventer. Last season we reached one of my lifelong goals of competing successfully at the Preliminary level! Over the past 7 wonderful years, Orion has accompanied me back and forth from college and he has lived at barns in 3 different states. We have been using SmartPaks for about five years because they make it so easy to be sure he is getting the correct doses, and automatic shipping makes sure that we never run out. It has been great not having to deal with multiple supplement containers or messy baggies when we move around. Orion gets 1 scoop of Equinyl Combo, 1 scoop of Grand Hoof and 2500 IU of Vitamin E. Next month, he will also get 1 scoop of Apple-A-Day electrolytes to make sure he stays hydrated for the upcoming eventing season. I am looking forward to many more happy, healthy years with my buddy!